We're in the midst of another winter storm here in the Chicagoland area. I can barely see the home across the street from me. Of course, the media is more interested in where it is going to go: NYC and Boston rather than where it is at and what is occuring here. But then someone from Beantown once told me: Midwest? Oh! We only fly over that! 1. Put garlic, ginger, hot peppers, lemon juice, mint leaves, yogurt and salt to taste in the blender and blend into a chutney. This is your marinade. Taste it and adjust the tang and salt to suit your taste. Be prepared for a jolt of heat when you do this. It is quite concentrated!! Do this before you proceed to the next step. You don't want to take a chance with E.coli! 2. Put the chicken in a shallow pan and pour this mixture over it. If you are using chicken breasts, take a steak knife and make random cuts in the meat so that the marinade can permeate into the meat as much as possible. 3. Allow the chicken to marinate for about half hour or so, preferably in the refrigerator. In the meanwhile, you could cook something else to go with this. Vegetable Pulao, maybe? Or just put your feet up and gain control of the TV remote! 4. Pour oil in a flat large saucepan, just enough to coat the bottom. Heat the oil and when warm (not smoking) sprinkle the jeera (cumin seeds) all over. 5. Gently put the chicken into the oil and pour the marinade over it. You could cover the pan as the chicken cooks. It's up to you. I like to have the flavors waft into every corner of my home!! 6. 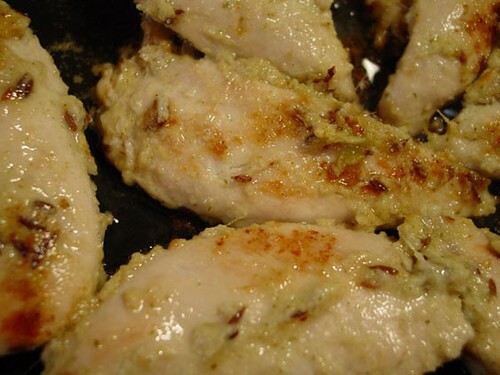 Sprinkle the chicken slices with freshly ground pepper so that they are nicely coated with it. 7. Turn the chicken over to the other side, do the fresh ground pepper thing and cook until almost done. 8. Then turn the heat up and dry up all the extra sauce. You need to keep turning the chicken over to ensure that it does not burn and to prevent the sauce from sticking to the bottom of the pan. As the sauce dries up, keep pasting it onto the chicken using the turner. It splutters all over the stove but, believe me, the mess is worth it as the chicken is delicious!! 9. Once there is next to no sauce in the pan, drain the chicken of excess oil by placing it on paper towels, making sure to take as much of the dried out sauce as you can. Enjoy the tangy sauce draped all over the chicken and the zesty crunch of the jeera with every bite!! Eat this hot with pitas or by itself or with pulao. A cold winter. 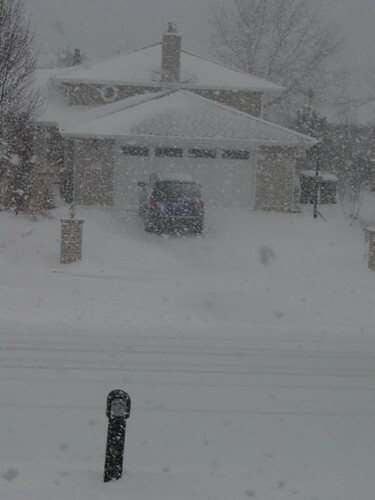 Near blizzard like conditions outside. Yum spicy jeera chicken! !